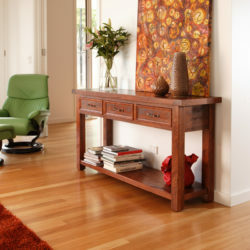 We chose to handcraft this timber entertainment unit in Tasmanian Messmate. You may prefer to have yours made in either Blackwood, Blackbutt, Spotted Gum, Jarrah or River Redgum timber. Benson has a 32mm Solid timber top and a range of standard options including door glazing or timber panel, centre speaker panel colours, and handles. Optional extras are also available with push close shelves and aluminium DVD and CD fixtures for drawers. A wide range of handles and timber stains are available or you may choose to supply a sample for colour matching. 2 doors and 2 drawers. Includes standard options. We can custom make products in many ways to suit your needs, please call the 'Showroom' or email us for further details.